The London Strings Festival, which opened on Wednesday 26 September 2018, with fine performances given by Ahmed Mukhtar on Arabic oud and the Veles Ensemble string trio, and the cello and piano duo of Emma Besselaar and Antonio Oyarzabal, continues tonight and over the weekend with concerts and a Luthiers’ Exhibition. 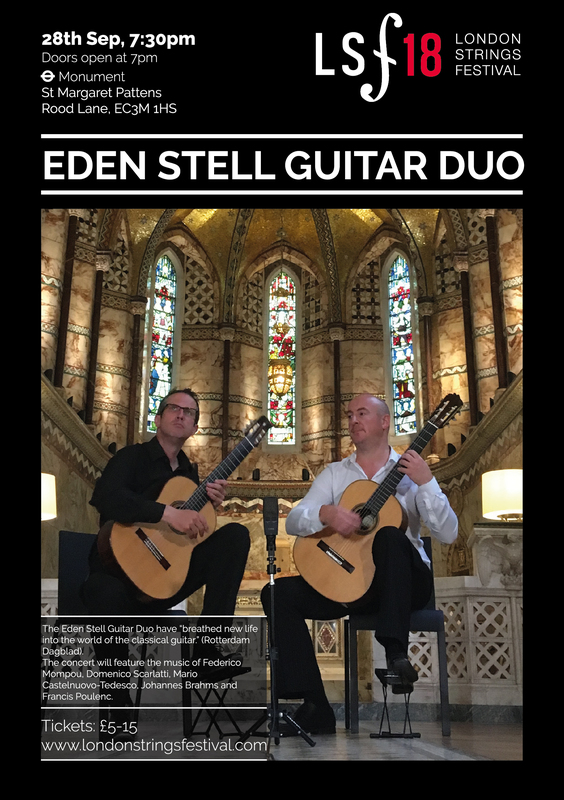 On Friday 28 September 2018, the Eden-Stell Guitar Duo will give a recital featuring music from their outstanding Mompou recording Cançons i Danses (BGS) at Saint Margaret Pattens Church, Eastcheap, EC3M 1HS, 7.30pm. Tickets. On Saturday 29 September 2018, there will be a Luthiers’ Exhibition, featuring the violin makers William Szott and Alan Beavitt, and guitar-makers James Lister, Oren Myers and Sam McClaren from 11am–12.30pm and from 2–5pm at St John’s Church, Pitfield, Hoxton, N1 6NP. 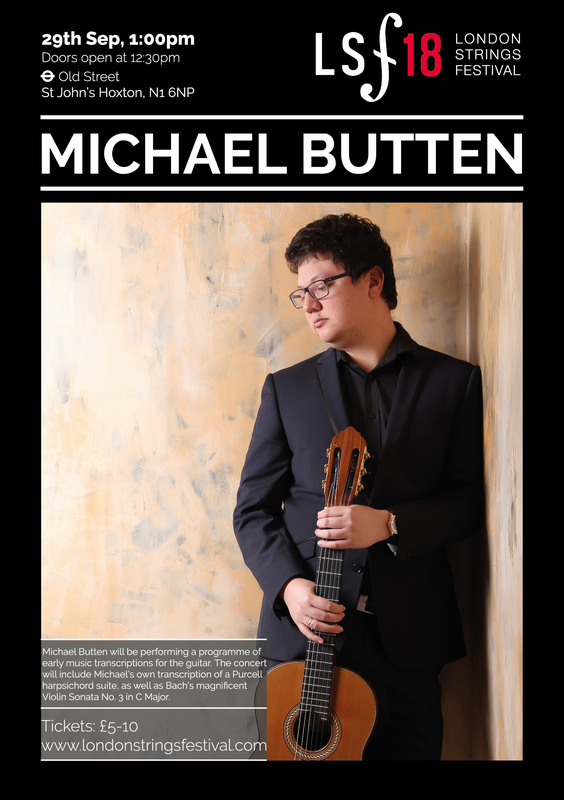 At 1pm, Michael Butten will give a recital, performing his own arrangement of a harpsichord suite by Purcell, as well as Bach’s Violin Sonata No. 3 at St John’s Church, Pitfield, Hoxton, N1 6NP. Tickets. 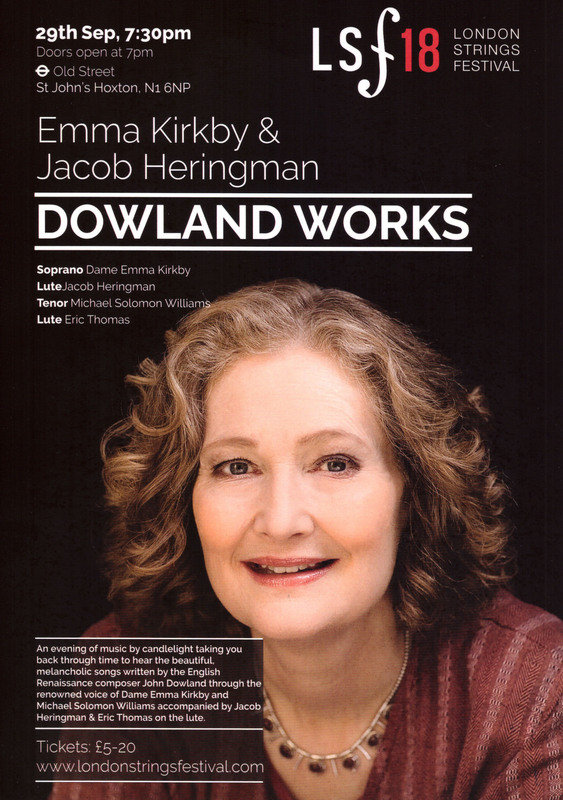 On Saturday 29 September 2018, the voices of renowned Emma Kirkby and Michael Solomon Williams will be accompanied by Jacob Heringman and Eric Thomas on lutes, performing works by John Dowland at St John’s Church, Pitfield, Hoxton, N1 6NP, 7.30pm. Tickets. 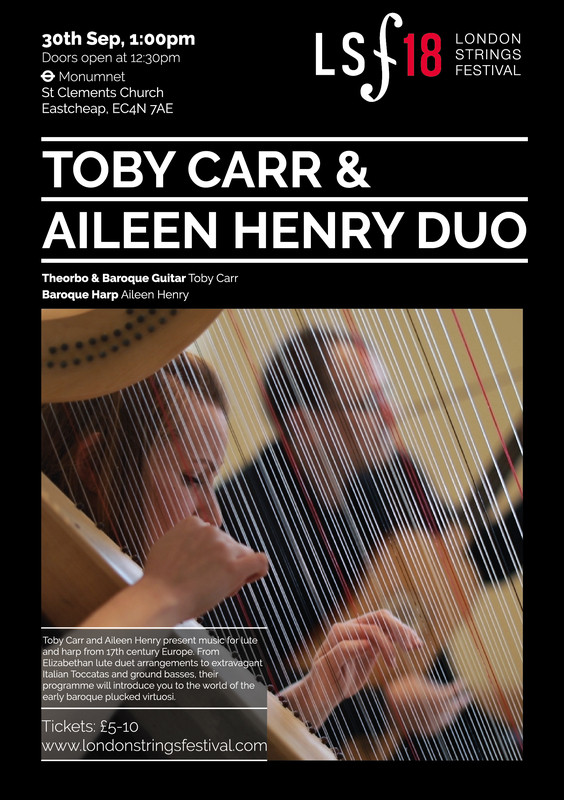 On Sunday 30 September 2018, there will be a midday recital by Aileen Henry (harp) and Toby Carr (lute) performing music from seventeenth-century Europe, arrangements of Elizabethan lute duets and Italian toccatas and ground basses at St Clements, Eastcheap, EC4N 7AE, 1pm. Tickets. 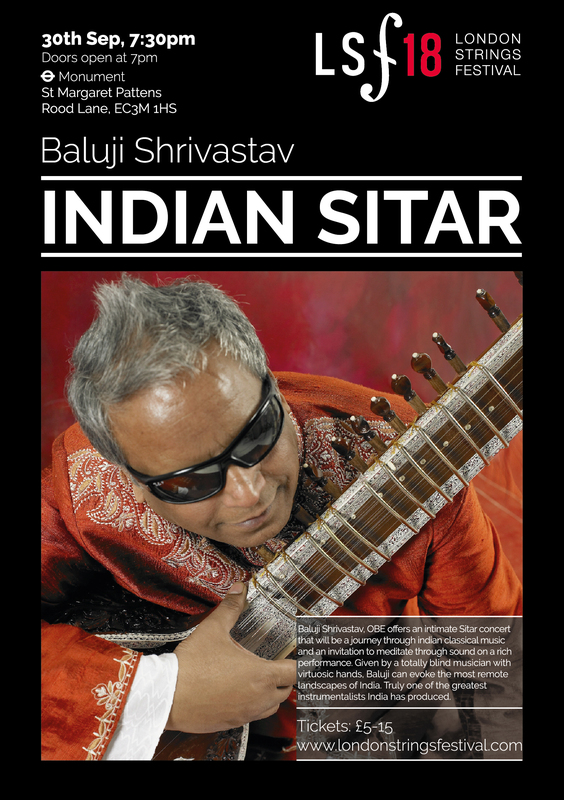 The Festival will end in the spirit with which it began, featuring the sitar player Baluji Shrivasta at Saint Margaret Pattens Church, Eastcheap, EC3M 1HS, 7.30pm. Tickets.